-by Br. Joseph-Anthony Kress, O.P. 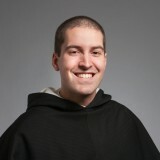 “The summer before I entered religious life my cousin gave birth to her first child, Owen. Later that summer the proud mother hosted a party at which the main pastime was holding baby Owen. As everyone took his or her turn with the newborn, I noticed something astonishing: all of the men held him in precisely the same way, and all of the women in another. As my sisters, my aunt, and my cousin held Owen, I noticed that each held him in both of her arms, allowing him to lie horizontally on his back. When it came time for the men to hold him, we took a different approach: we each held Owen in a vertical posture, with his body parallel to our own and having him rest on our chest. Without exception, each of the men instinctively held Owen in this position. A father is responsible for much more than providing food and shelter, for he also has a vital role in educating children in the faith and how to live uprightly in the world. The Second Vatican council states explicitly that “the active presence of the father is highly beneficial to their formation” (Gaudium et Spes 52:1). This “active presence” of the father begins with his leading of the family. If the father is a leader in the home, then the Catechism’s statement, “the home is the first school of Christian life and a school for human enrichment,” has particular import for men (CCC 1657). In order to navigate the paths of human life one has to address the totality of the human person. Human flourishing is accomplished only when the body and soul are integrated, and not separated. A man is not more authentically masculine when he focuses only on the physical things of the world. Rather, he denies part of his masculinity because he ignores part of his humanity. A man neglects one of his primary roles as a father if he fails to teach his children the importance of the spiritual life. This does not mean that he must be a spiritual master and write brilliant theological treatises. But what he is called to do is to witness to the salvation that comes through Jesus Christ, and love as Christ loves (cf. Ephesians 5:25). manner in which he holds a child testifies to it. The task of leading the family, or the domestic church as the Catechism calls it (CCC 1655), has been entrusted to men. Again, the home is the “first school of Christian life and a school for human enrichment.” In other words, it is the foundation on which society is built. If a father desires to have an effect on the world and make it a better place for his family, he must be a man devoted to the spiritual and human development of each member of his “domestic church.” He cannot give what he does not have, and he cannot teach what he does not know. Thus, he must be a man who is firm in his own faith in Jesus Christ. We learn from the Divine Teacher how to teach those around us. The greatest act of teaching was the crucifixion on Mount Calvary, when He taught us what an act of love looks like. Christ gave His life for us so that we may have life eternal, and our efforts to imitate His act of love can be manifest in the most menial of our daily tasks. The constant changing of diapers, driving the kids to soccer practice, cooking dinner, working long hours at the office, setting time aside for prayer, or even simply laying an infant tenderly in his bed, can be transformed by grace into acts of love. Daughter of Laurent Cousin, a farm worker, and Marie Laroche, who died while Germaine was an infant. A sickly child, Germaine suffered from scrofula, which is tuberculosis of the skin. She was afflicted with unsightly inflammation of the lymph nodes in her neck usually contracted from unpasteurized milk from infected cows, and her right hand was deformed. Ignored by her father and abused by her step-family, she was often forced to sleep in the stable or in a cupboard under the stairs, was fed on scraps, beaten or scalded with hot water for misdeeds, real or imagined. At age nine Germaine was put to work as a shepherdess, where she spent much time praying, sometimes using a rosary she made from a knotted string. 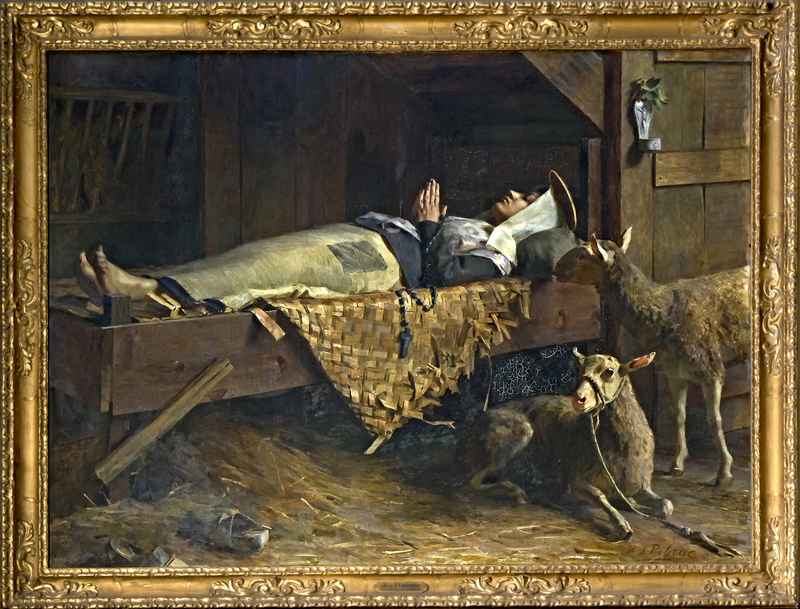 She refused to miss Mass, and if she heard the bell announcing services, she set her crook and her distaff in the ground, declared her flock to be under the care of her guardian angel , and went to church; her sheep were unharmed during her absences. It is reported that once she crossed the raging Courbet River by walking over the waters so she could get to church. others, but she was always ready to try, especially children whom she gathered in the fields to teach a simple catechism and share the little food she had. 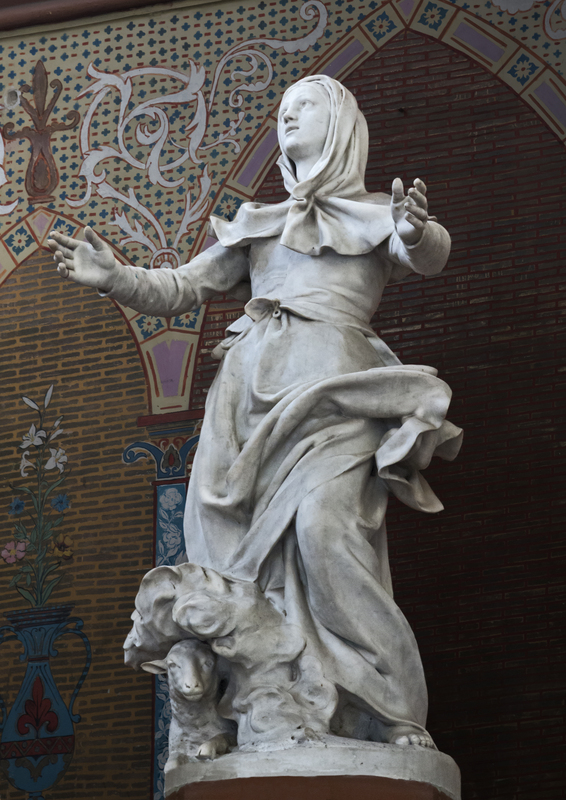 The locals laughed at her religious devotion, and called her ‘the little bigot’. Once in winter, her stepmother, Hortense, accused her of stealing bread by hiding it in her apron, and threatened to beat her with a stick. Germaine opened her apron, and summer flowers tumbled out. 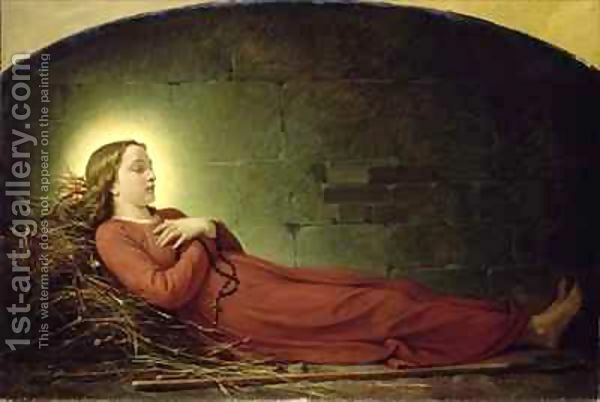 Her parents and neighbors were awed by the obvious miracle, and began to treat her as a holy person. Her parents invited her to rejoin the household, but Germaine chose to live as she had. In 1601 she was found dead on her straw pallet under the stairs, and she was buried in the Church of Pibrac opposite the pulpit. 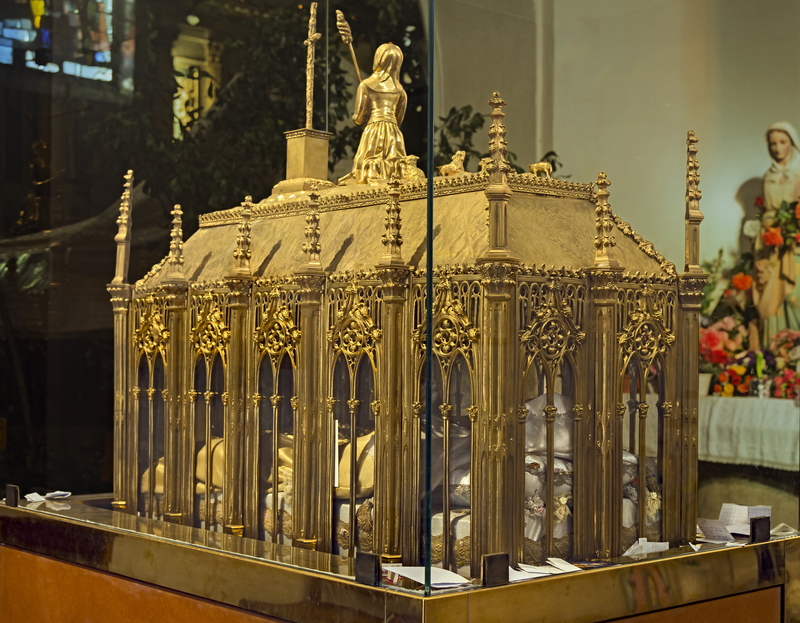 When accidentally exhumed in 1644 during a renovation, her body was found incorrupt. In 1793 the casket was desecrated by an anti-Catholic tinsmith named Toulza, who with three accomplices took out the remains and buried them in the sacristy, throwing quick-lime and water on them. After the French Revolution, her body was found to be still intact save where the quick-lime had done its work. Documents attest to more than 400 miracles or extraordinary graces received through the intervention of Saint Germain. They include cures of every kind (of blindness, both congenital and resulting from disease, of hip and of spinal disease), and the multiplication of food for the distressed community of the Good Shepherd at Bourges, France in 1845. 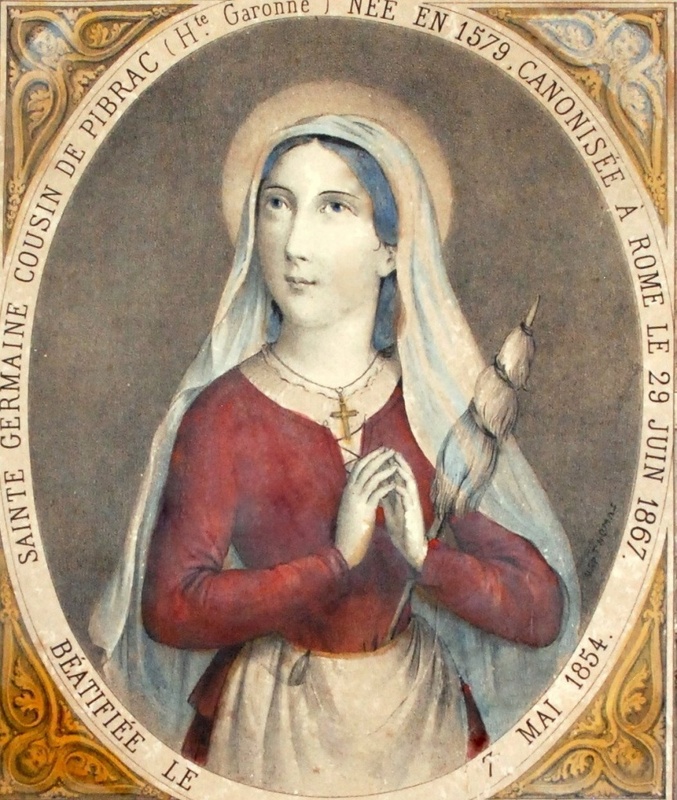 O Saint Germaine, look down from Heaven and intercede for the many abused children in our world. Help them to sanctify these sufferings. Strengthen children who suffer the effects of living in broken families. Protect those children who have been abandoned by their parents and live in the streets. Beg God’s mercy on the parents and adults who abuse children. Intercede for handicapped children and their parents. 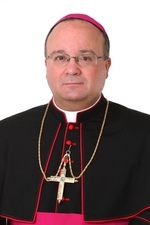 Tapped by then-Cardinal Joseph Ratzinger, today Pope Benedict XVI, to handle the canonical response to charges of sexual abuse against priests, Scicluna is widely seen as the architect of the more aggressive approach to the crisis which emerged in the Congregation for the Doctrine of the Faith after 2001. As an activist for the protection of children, I have spent the last three years reading and hearing the unreadable and the un-hearable. I will wish I had not read it, or heard it until I die. I can understand how someone unfamiliar with the subject would not understand. Tragically, ignorance does not heal the afflicted. I have observed how different countries have responded. Archbishop Martin, it is my strong opinion, has responded in a more open, honest and healthy way than the Church in the US continues to do so. I still meet and speak with the ordained here in the US who “don’t get it”. They should spend more time with the survivors of clerical sexual abuse, if those survivors could tolerate their presence. I can tell you from much personal experience, those survivors are a blessing to me. They reflect God to me, more than defensive denial or minimization ever could. We must relearn the words and the meaning of the words as Catholic Christians, “mea culpa, mea culpa, mea maxima culpa”. Every one of us. And beg the mercy of God and the forgiveness of survivors of offenses by the Church. The Lord is a just judge. (Psalm 7, etc.) We must also remember the judgment of the Lord will be harsher upon those who have received the sacrament of Holy Orders, therefore a sacrament most grave. “Only a few months ago, here in Dublin’s Pro-Cathedral, we celebrated a liturgy of lament and repentance reflecting on the shattering facts regarding the wide-ranging abuse of children by priests and religious in this diocese and about the manner in which the Church in this diocese responded to that abuse.It was for me a moment of hope. The liturgy had been prepared by survivors of abuse and survivors took part in the carrying out of the liturgy. Courageously, men and women who had been abused spoke out about their hurt and their hopes. It was a moment which I know brought healing to many and gave them renewed strength in themselves and some sense of renewed hope in the Church which had not believed them or had even betrayed them. At that liturgy I saw many faces that I knew in tears; I watched others whose names I will never know sit alone in silence and sadness.My first thoughts on reading the Cloyne report went back to that liturgy and to those who organized it and took part in it. I asked myself: what are they thinking today? Are they asking themselves if that entire liturgy was just an empty show? Were they being used just to boost the image of the Church? Were their renewed hopes just another illusion about a Church which seems unable to reform itself? Was their hurt just being further compounded? I thank the priests and lay persons in this diocese who have committed themselves to implementing our child safeguarding policies and I appeal to them not to be become frustrated or indifferent. The Church needs you. The children who frequent our Churches need you. Parents need to be reassured by your presence. Public recognition is due to the mobilisation within the Church of so many volunteers who are in the front line in our parishes and organizations in child safeguarding.Those priests who have ministered untarnished and generously over years – indeed for an entire lifetime – should not be made scapegoats and objects of hate. Priests deserve recognition for the good they do and they need the support of their people. I appeal to those priests who have become demoralised and half-hearted not to give in to cynicism but to heed the Lord’s call to renewal and conversion. While recognising the challenges of our current economic crisis, our long-term economic planning cannot overlook the need to provide not just protection but also vision, hope and opportunity for this future generation. The Proclamation of 1916 contained a vision of solidarity and inclusivity which dreamt not just of the freedom for Ireland’s people, but also of their welfare; it hoped for “equal rights and equal opportunities for all its citizens”; it dreamt of a society “where all the children of the nation would be cherished”. These are perennial goals for our nation which must at all times be a clear focal point for future economic and social planning.The same proclamation and vision of those who founded our republic recognised that religious and civil liberty of all was to be fostered. A republic is not indifferent to the faith of its citizens. A republic respects the specific rights of believers. It recognises the role of believers in contributing to the common good as they journey with others in search of that hope to which we are all called as human beings and believers.Great damage has been done to the credibility of the Church in Ireland. Credibility will only be regained by the Church being more truly what the Church is. Renewal will not be the work of sleek public relations moves. Irish religious culture has radically changed and has changed irreversibly. There will be no true renewal in the Church until that fact is recognised.The Church cannot continue to be present in society as it was in the past. That is not to say that the Church will be renewed by that changed culture or should simply adapt itself to the vision of that new culture. The Gospel reading reminds us that the Church lives its life in the midst of different cultures and indeed with the presence of sin in its own midst. As believers we know that in the long-term Christ who sows the good seed in our midst will work tirelessly to see that those forces “that provoke offence and who do evil” will not prevail but will face judgement on their lives. It would however be false to interpret the Gospel reading as if we should simply sit back and allow good and evil to grow together in the hope that in the end the good will win out. It is reminding us that fidelity to the message of Jesus is the way in which we will ensure the victory of the good.The Gospel reading cries out: “Listen”, anyone who has ears”. Rarely more often than in our day are we as believers called to listen, to take note, to be alert and on our guard, so that the virtuous life will shine through us in our world.